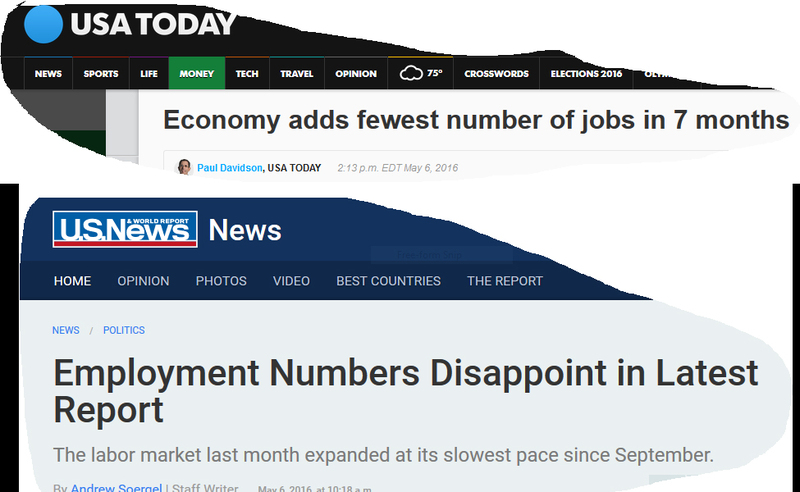 It is no secret (except to folks in Washington DC) that it is small businesses who have led us out of every recession in our history (50% of all jobs and 65% of new jobs). While large corporations hoard money for acquisitions and to invest in innovative technologies to replace humans (because they can afford to) it is the small business owner who judges the horizon and takes the risk to hire talent to grow. Likewise it is the entrepreneur who decides to invest his/her life savings and those of family and friends for a start-up idea or franchise ownership. This is where new jobs are formed. And this is how rampant national under-employment or unemployment issues get resolved. 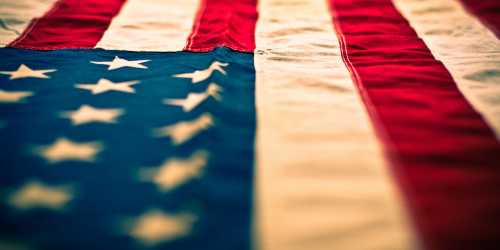 A rather startling bit of historic news broke a few years ago about startups in America. 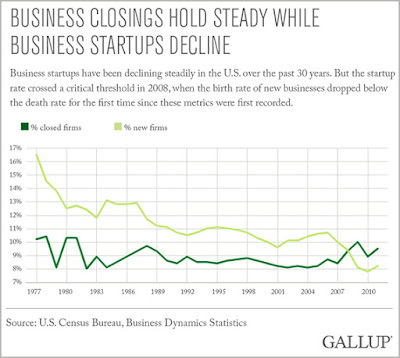 In 2008, emerging startups for the first time in history trailed business failures. 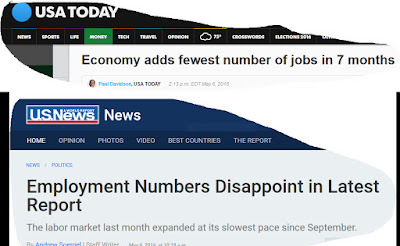 That means more business are failing now than are new businesses entering the market to take up the slack in jobs. Some great insight into this trend can be found in this article by Jim Clifton, Chairman and CEO of Gallup. He had a quote in the article that truly captures the challenge we face in America. "Let's get one thing clear: This economy is never truly coming back unless we reverse the birth and death trends of American (SMB) businesses." My intent here in this two-part article is to candidly address these two topics (the birth and death trends of SMBs). I will share a perspective - why and how to improve - that comes from 14 years of consulting for privately held businesses and advising/mentoring startups. Part 1 - Why are they failing? To fix the problem we have to understand the problem. Let’s first discuss business failure rates. According to the Small Business Administration, a business started in 2004 has a 48% chance of still being around today - half are gone. The number-one reason businesses fail is rather obvious - they flat run out of money. But how does this occur? Choosing a business that isn't very profitable. Failure to clearly define and understand your market, your customers, and your customers' buying habits. Failure to price your product or service correctly. Failure to adequately anticipate cash flow. Failure to anticipate or react to competition, technology, or other changes in the marketplace. Overgeneralization - be everything to everyone. Overdependence on a single customer or customer set. Believing you can do everything yourself. Putting up with inadequate management. This list is very comprehensive and accurately captures what I have observed. Sadly, these are all preventable, everyone of these causes are, if only business owners would follow the very basic business rules - the very first of which is have a plan, or in the case of a startup, write a business plan (before you launch). A war is being waged against business/strategic plans. "Business planning is broken. In a world that is constantly changing and increasingly complex, business leaders can’t plan for a predicted future anymore. By the time an annual business plan is ratified the market has moved on to places that nobody could have imagined. If businesses are unable keep up with changing customer needs they stagnate or decline. Leaders need to abandon traditional business planning and embrace the creative process instead. Business plans should look more like sketchbooks than spreadsheets. What do sketchbooks do? They help artists unlock ideas, to experiment and learn, to stretch boundaries, and to build talent. Artists take their best ideas from sketchbooks and use them to create their best work. Businesses should operate as a similar collection of experiments. The testing and refining of new growth ideas ensures a constant connection with a changing customer base. Aggressive growth happens when leaders are able to continuously shift investment to those ideas that show the most promise." His contention, like so many taking this position, is that the marketplace is changing SO rapidly it is just not possible to plan. He is also suggesting the best and most respected business owner (CEO) is the one who stands up in front of his/her employees with his sketch book of ideas on where he is taking the business. Do you want to follow this leader? This is all utter BS and this mindset explains in part the sad failure rates for start-ups and established businesses alike. What basic human problem am I solving? Do people want to buy my solutions? What is my proof? How big is the marketplace that I am selling to? Who are the competitors/trends I should pay attention to? What skills/people do I need on-hand to sell and deliver my solution? How many widgets will I have to sell to cover costs and be cash-positive? How long can I operate with cash on hand? If you look at these 8 basic questions and compare them to the reasons for failing you have to wonder why business owners fight this basic step of business. I‘ve heard a few excuses over the years and share them here. Because of this, some (especially politicians) will immediately point their finger at our banks and other financing institutions and blame them for this problem. “If they would only loan more we would solve this problem.”, they will claim. There are even those suggesting the criteria for loans guaranteed by the Small Business Administration should be lowered to “untie the hands” of the banks. Asking banks and our government to assume larger risks is not the answer. While it is unimaginable to find the CEO of Coke, Facebook, Home Depot or Uber unable to intelligently discuss forecast sales, cash flow, profits, trends that may impact their market, the competition they face and long-range growth strategies, these types of conversations with SMB’s and startups are dubious at best. So to suggest easier access to US government-backed loans is crazy talk. Let’s not make this mistake again. We’ve seen and felt what happens when our banks and government invest in speculation (Solyndra). Heal thyself American business owners and save our economy (play the Battle Hymn of the Republic now). America needs you, small and medium sized business owners. We need you more than ever! There is nothing Congress, or the President can do that will have a more dramatic impact on our economy and jobs than you can by dismissing those who irresponsibly suggest there are shortcuts to success in business. Or those suggesting you can Tweet, or social media, or robo-call your way to growth. Dismiss the notion that simply having an idea and ambition is all that is necessary to launch a start-up. I implore you to help heal our economy by healing your businesses. Become a disciple for businesses owners around you by first following the basic tenets of a growing business - have a plan, execute to the plan. Inspire your workforce with a vision of the future and a realistic written growth path. Show you can lead. Show you can set goals and achieve them on a recurring basis. Show you can be a responsible steward of someone else’s money (a bank for instance) by repeatedly making prudent, plan-based decisions on hiring, marketing, capital equipment and services. Let your profitable sales win-rate reveal how well you know your customer and respect your competitors. And finally, surround yourself with smart, critical thinkers who will not shy away from challenging you or telling you what you need to hear. If you do these things you will do more to transform your business, the lives of your employees, and our national economy than any new President, Congress or trade deal could ever dream of doing. And my message to Washington DC - get the heck out of the way! 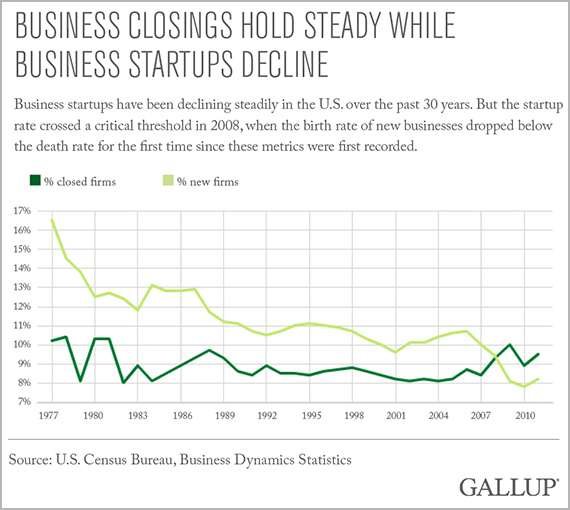 Part 2 will examine the second issue facing America - the declining birth trends of SMBs. 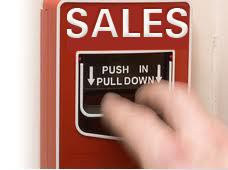 When listening to CEO's and business owners talk about some of the sales challenges they face I have found myself using the phrase "my sales alarm is ringing" to indicate that something they said wasn't sitting well with me. I guess this is my equivalent to Spiderman's "Spidey sense" - a strong feeling that something is very wrong here. You forecast a sales decision to be made by the end of the year and the customer still has not made a decision two quarters later. You declare a particular sales pursuit a corporate priority and you lose it. Any time you are 'surprised' that you lost. If you have EVER said, "there is no competition" either because you think you are the only company under consideration or are arrogant enough to believe the customer has no other choices. You think your customer owes you the business. When sales leaders assure the boss that they will win because they “know a guy” or feel they have an exceptionally close relationship with someone in the company. When your sales team comes back from an important sales trip and says, "our presentation was well received". When you've secured a business dinner, golf outing, demonstration with a prospect and can't articulate the specific measurable goals you have for that valuable customer encounter. When your leadership gives higher priority/emphasis to the number of "opportunities" they have in their "funnel" rather than win-rate, or if your strategy is to “place a lot of bets” so that you can win “your fair share” of new business. When you don’t know your sales win-rate. When your sales team spends more time talking about activities or the 'close' relationships they have with the prospective customer than what they know about how a decision will be made.… as if the shear evidence of this activity (golf outings, dinners, hunting trips, etc...) is a positive indicator of who will win or lose an upcoming sales opportunity. When your salesperson can't succinctly answer this simple question, "What is the number one priority the customer will use to make its selection?" one week prior to submitting a proposal. When asked who are you selling to and your reply is something vague or as ill defined as, "lawyers" or "small businesses" or "anyone who needs printing" or "potential home buyers/sellers" or "anyone who needs insurance" or “large corporations”. When your assigned salesperson can't name the top three individuals by name who carry the most influence on the outcome of an upcoming sales decision. Anytime you feel good about coming in a ‘close’ second or are consistently coming in second to rivals in your sales pursuits. Anytime an existing customer moves his contracted business to a rival. If you've ever said the customer "was stupid" or "didn't understand our offering" or "we must tell our story better" when explaining why you lost. If ANY of your sales presentations has an organization chart in it. When you think consistent sales success is based on something vague like “having the right team in place”, “being energetic/confident/enthusiastic”, ”treating your customer with respect”, or “delivering great customer service”. When you consistently miss quarterly sales goals. When no one is held accountable in any way for a significant loss. You don’t have a “lessons learned” process, or you have one but you don’t incorporate the lessons you identify into specific process changes, or you only use your process after a loss (as a witch hunt). If any of these applies to your business, run, don't walk, to the nearest alarm and pull it. You have a sales emergency that needs to be addressed right away. If you don’t know why these should trigger an alarm, connect here and we will explain why we think so and recommend what to do about it. About the author. Mike Gomez is founder and CEO of Allegro Consulting, a business growth specialty consulting firm in Atlanta, GA. Their mission for the past 14 years is to help their clients define strategies for growth and overcome obstacles that may stand in their way. Mike is a prolific speaker, writer, former aerospace engineer, and sales executive for McDonnell Douglas, Boeing and Lockheed. He is credited with sales wins totaling $10B. His talk, "Winning the $2.5B Israel Fighter Jet Shootout" chronicling Boeing's wins over rival and incumbent Lockheed is a one-of-a-kind story that will motivate, teach and inspire any sales team. 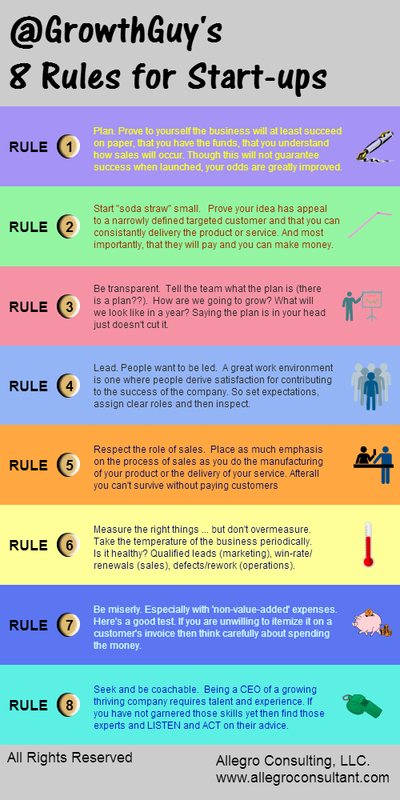 @GrowthGuy's 8 Rules for Startups - from 14 yrs. of Business "Accident Investigations"
In my past life I supported aircraft accident investigations. The primary purpose of these investigations was of course to find the root cause for why the accident occurred. Equally important was the transmittal of the findings and conclusions to the entire aviation community (pilots/crew, maintenance, designers, air traffic control, etc...) in an effort to prevent the accident from happening again. 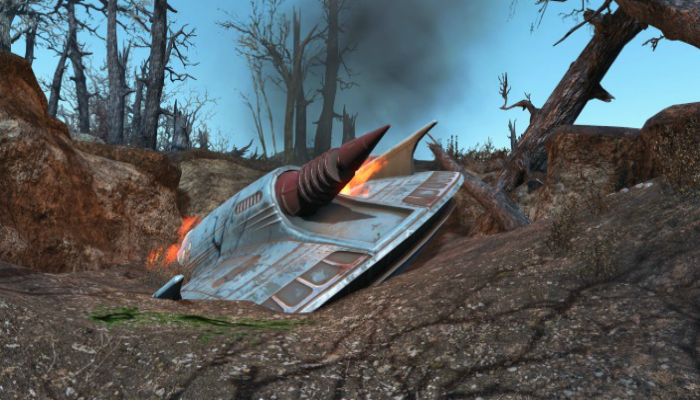 (Learn from a real jet crash: “What a jet crash can teach a business owner” ). Sadly, in my 14 years of consulting for small businesses and startups alike in Metro Atlanta I have visited too many business "crash" sites. In an attempt to prevent a crash, or better yet, improve your chances for success, I share these findings from those who faltered of failed. This list is intended to be complimentary to Mark Cuban’s outstanding 12 Rules for Startups published in Entrepreneur Magazine back in 2012. Start ‘soda straw’ small. “I want to sell our solution to lawyers.” “I want to provide our services to any tech startup.” “This new CRM solution is for ANY small business.” These are real examples from start-up founders who each had a minimal sales force. The problem with this approach is the size of the customer target dwarfs the typical staff and resources available to communicate with this audience in any meaningful concentrated manner. The more effective approach is to carve out a narrow segment of the target demographic (by geography, specialty, etc...) and concentrate your resources accordingly then prove your business model can succeed with that segmented customer. Then, and only then, grow by pursuing new customer demographics in “one vector off “ increments. Be transparent. Tell the team what the plan is (there is a plan - right? ), who are the competitors, why are we different, how are we going to grow, what the company can/will look like a year from now, and how will we make that vision a reality. Saying that the plan is in your head just doesn’t help anyone. Worse than that, keeping the plan a ‘secret’ provides for the use of that number one of all excuses when goals aren’t met, “I didn’t know.”. Lead. People want to be led. That is a fact. A great work environment is one where there is personal satisfaction for directly contributing to the growth of the company. I heard from one CEO of a Fortune 100 company that his leadership style was to “set expectations then inspect”. Perfect and succinct. So lead by assigning clear roles and responsibilities, set measurable expectations then inspect to ensure your plan is being followed and the team is getting the support, training and resources they need to do their jobs. Measure the right things. But don’t over measure. 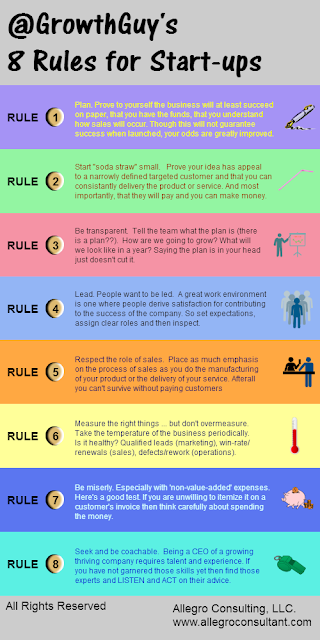 Taking the temperature of the company is important to gauge it’s health and how well your team is performing to the plan (there is that word again!). Here are a few of my favorite things to measure: qualified leads (marketing), win-rate/renewals (sales), defects/rework/on-time delivery/production cost (operations), operating cash flow (finance). Seek out advice and be coachable. Being a good lawyer doesn’t automatically mean you have the experience to be the CEO of your newly formed law practice. Same thing holds for a gaming coder, software developer, or a doctor, engineer, or a chemist. And lastly just because it was your idea or invention doesn’t mean you are equipped with the skills to lead and grow a company. Sad to see an owner finally grasp, “You mean the problem is me?” just before the business is shuttered. Worse is everyone around him/her already knew this. Running a growing thriving company is hard and requires talent and expertise. If you have not gained that expertise through varied job experiences then seek out those experts and LISTEN and ACT on their advice. Need help with you Metro Atlanta, Georgia start-up? Let's have a cup of coffee. Contact me here. About the author. Mike Gomez is President and CEO of Allegro Consulting, a growth specialty firm in Atlanta, GA. Allegro has been helping Georgia’s private business owners to plan and execute strong growth strategies since 2002. Mike is a strategy and sales process evangelist and coach with a tool chest built on direct experience in international sales ($10B), strategy and program management. He is an advisor at Atlanta Tech Village, judge for Next Top Entrepreneur, a prolific speaker, writer, former aerospace engineer, and pilot of both aircraft and helicopters.